There’s always a brand in the world that I’m intrigued about. It could be something new, or perhaps a re-brand of a timeless classic, or in the following case, a 61-year-old brand that I’ve simply never had the chance to experience. Well I can tick off one from this sub-category as tonight I have had the pleasure of being introduced to Royal Salute via the medium of a tweet tasting. 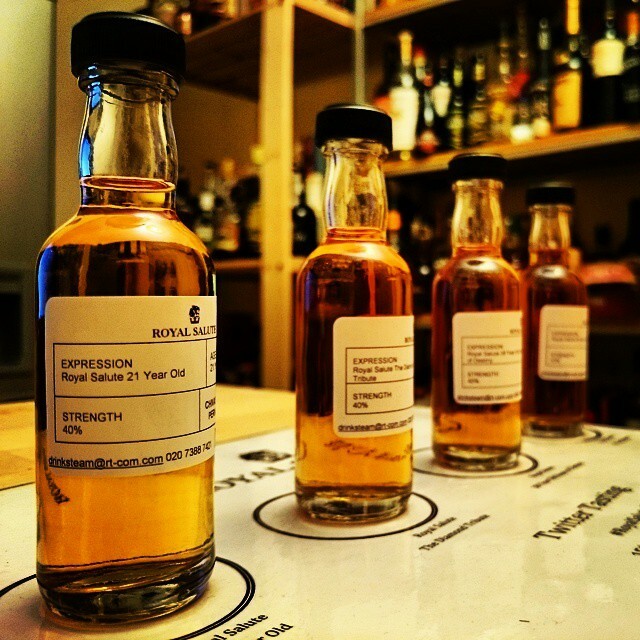 For those who don’t know, a tweet tasting is a social media (Twitter to be precise) based tasting of a variety of expressions, involving many experts, novices and connoisseurs who give their opinion on the brand as they work their way through the portfolio. For me, it’s a great chance to sit down and get my head around a specific brand whilst chatting to like-minded folk, plus it throws in one or two expressions I’ve never had the pleasure of trying. In the case of Royal Salute though, my slate is clear. 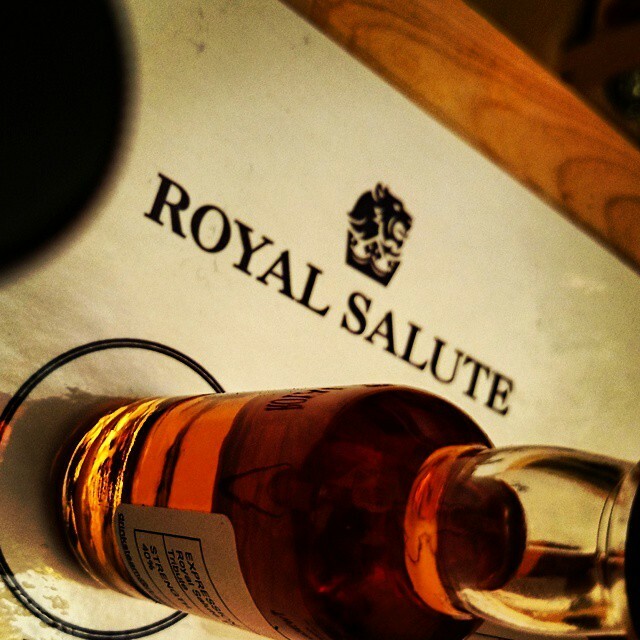 First though, a little about Royal Salute. Royal Salute came about due to a man called Charles Julian, Master Blender at Chivas Brothers, wanting to mark the coronation of Queen Elizabeth II in 1953. He worked to create an unheard blend of whisky, a 21yr, and ultimately took the name from the Royal Navy’s traditional 21 gun salute. 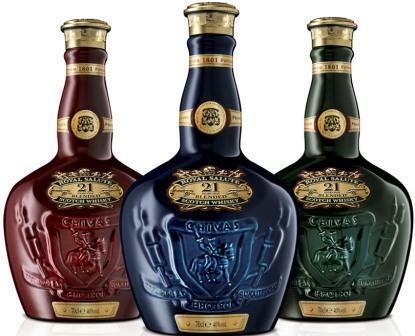 Created within the Strathisla distillery, located in Speyside and owned by Chivas Brothers, Royal Salute has only ever had four Master Blenders since its inception, and prides itself on being the only Scottish whisky with a range starting at 21 years old. In fact, that very first Royal Salute 21yr was said to have been created with some of the world’s rarest whiskies that were aged in cellars since the 1920’s and 1930’s. It’s not just the liquid that is rare to create, but the bottles themselves have a story to tell. Or to be precise the Royal Salute 21yr, for example, is housed within a porcelain flagon. Each flagon’s journey can be traced to the Jurassic period, with its Cornish clay from the period being hand-crafted, air-dried and then burnished in one of three colours – Ruby, Emerald and Sapphire – to represent the jewels on Queen Elizabeth II’s Coronation crown. Or how about the Royal Salute 62 Gun Salute decanters, crafted by Dartington crystal. These are individually blown by the Master Glass Blower who creates a midnight blue outer wall and a crystal clear inner wall. The bottle is then hand cut with a diamond-tipped tool so that both the clear glass and the whisky can be revealed through the blue crystal. Each decanter is the result of over forty hours of care and attention. A marriage of whiskies aged no less than 21 years. Sweet fruits on the nose with plenty of Autumn air aromas coming through. Subtle dry oak with beeswax notes too. Smooth start on the palate, with a slight developing spice. Orange marmalade flavours combine with dry nuts, leather and dry spice to finish. Long. Created by Colin Scott to mark the 60th anniversary of HM The Queen’s Coronation. Royal Salute The Diamond Tribute has been crafted from an exclusive collection of whiskies, the rarest of which have been selected from the Royal Salute Vault at Strathisla, the oldest working distillery in the Highlands of Scotland. Plenty of peach on the nose with soft sherry notes lingering. Very rich and thick on the palate, with sweet raisin and dry plum flavours dominating. Lingering dryness to finish with a slight toffee kick. Crafted from whiskies aged for no less than 38 years, this unique blend shares its name with the Stone of Destiny, the legendary and enigmatic Coronation stone of the ancient Scottish Kings. Lots of damp sherry oak on the nose with hints of wood-infused vanilla and dried almonds. Very rich on the palate with plenty of dried fruits, floral forest floor and thin honey kicks. Long, rich and mouth-watering. Previous Master Blenders Charles Julian, Allan Baillie and Jimmy Lang, as well as current Master Blender Colin Scott, have all set aside over the years a rare collection of the finest whiskies. With 40 years of maturation, only a few litres are bottled from each cask. Named after the ultimate ceremonial honour in the British tradition, the firing of 62 cannons which is an exclusive privilege of the Tower of London and reserved only for the most special Royal anniversaries. Ripe plums dominate the nose, with lots of fresh berry notes combined with warm spice. Oh wow! A fantastic palate that develops from light and sherry flavoured to an incredibly rich orange, hazelnut and fresh smoke finish. Bold, intense and absolutely fantastic. An absolutely cracking range of blended whiskies here, with the 62 Gun Salute one of the best I’ve come across, and I can safely say matches the price. You really get a sense of prestige with these expressions and is a worth-while treat for any whisky lover. One for the cabinet at home perhaps, or at least one to look out for in your favourite whisky haunt.